Lorraine Beverly (Johnson) Drake was born on May 13, 1932 to Agnes and Birger Johnson in Cumberland, WI. She married James Douglas Drake on February 10, 1950 also of Cumberland. 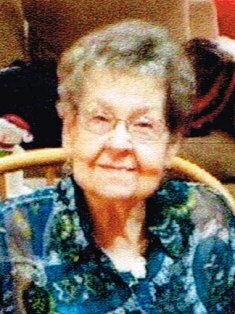 She passed away peacefully at Gundersen Health System, La Crosse on Friday, August 17, 2018. Our mother was an extraordinary, selfless woman. She raised five children, loved us all unconditionally, and gave us everything we ever needed and more. After our father lost his vision, she became his caregiver. She went on to survive two more years of life after he passed and after 66 years of marriage. Mom loved flowers, fishing, and family. She also had an obsession of sorts with the weather, telling us she had learned much from her grandfather as a child. She will probably be telling Mother Nature to move over. She held various positions of employment throughout her life but enjoyed being a veterinary assistant the most. She always considered herself a realist and was accepting of all life’s struggles. She had a deep belief in Christ and strongly believed in visits from angels. As a family, we are all glad that our parents are once again together for eternity. May they rest in peace. They certainly deserve it. Lorraine is survived by her five children, Randy (Linda) Drake, Reta (Aaron) Fikar, Rick Drake, Mike Drake, and Jay (Sheila) Drake. She is also survived by 11 grandchildren, Melissa, Josh (Lucy), Nichole (Ed), Jamie (Derrick), Jesse, Sara (Adam), Chrissy, Amanda, Chase, Kole, and Kenni; 8 great grandchildren; her brother, Richard (Helen) Johnson; and her sister, Karen (Lowell) Dague. She was preceded in death by her husband, James; her parents, Agnes and Birger; and a brother, Harold. We want to sincerely thank Amber Oshan, P.A. at the Sparta Gundersen Clinic for all the loving care she gave our Mom for many years and for always being there for her. Also a huge thank you to end of life care at Gundersen Health System. Especially Dr. Sallaway, Dr. Wendell, Zari Averbeck, RN, and Chaplain Blake Gooch. The kindness and care shown to Mom by all of them and all of the nurses involved was absolutely wonderful. Thank you all.